Heathrow air traffic control tower construction. Heathrow Airport became heavily congested as a result of the delays to the terminal five project. Heathrow ATC tower cab movement. Heathrow ATC tower showing cable stays. By building terminal five, air traffic levels are expected to increase to accommodate an extra 30 million customers each year. 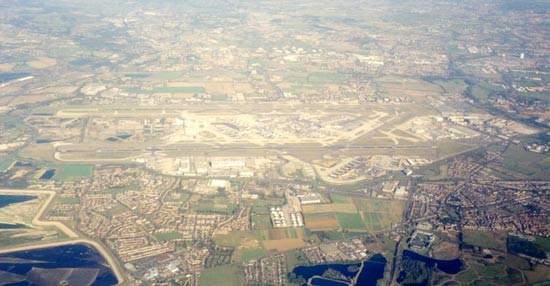 Aerial view of Heathrow airport in 2001. The terminal five project required an estimated investment of more than £4.2bn. The UK National Air Traffic Services (NATS) has installed a BEST ATC Tower Simulator from Micro Nav for London Heathrow Airport. The 87m-high ATC tower at London Heathrow. Aerial view of T5 showing the proximity of the M25. Main terminal interior view (concourse A). Artist's impression of the new Terminal 5 at Heathrow Airport. The terminal opened in April 2008 and the second phase opened in 2011. Overview of the T5 site. T5 opened in March 2008. The T5 roof weighs 18,500t and is held up by 22 supports. Heathrow's new terminal underwent extensive testing in the run up to the opening day. Sadly, this did not prevent teething problems. The airport is used by 86 airlines which connect to 183 international destinations. Nearly 46% of the airport’s passengers choose Heathrow as an intermediary for their long-haul flights. The airport lies 22km west of central London and is the only airport hub of the UK. The airport site encompasses an area of 12.14 square kilometres. There are currently five terminals with two parallel main runways and a crosswind runway. The airport is owned and operated by BAA, which is also responsible for the UK’s other prime airports including Gatwick, Stansted, Southampton, Glasgow, Edinburgh and Aberdeen. Heathrow International Airport underwent a major expansion in 2008 with the completion of Terminal 5. The second phase of the project was completed in June 2011. 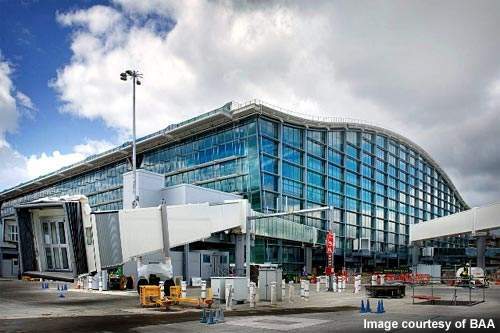 The airport expansion also included refurbishment of Terminals 1, 3 and 4, a new air traffic control tower, Terminal 5 station, tunnels for the extension of both the Heathrow Express (HexEx) and the Piccadilly Line and a motorway spur road from the M25. Proposals for a new Heathrow Hub railway station have also been given to connect Guildford, Reading and London Waterloo with the south-west of the airport. 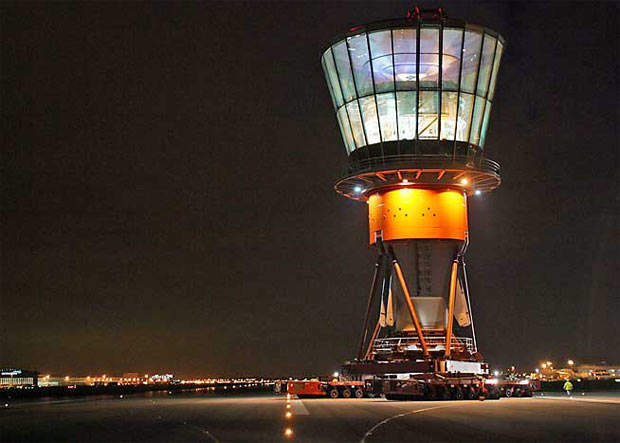 A new air traffic control (ATC) tower was installed at the airport in April 2007. The 285ft tower provides completely unobstructed views. The UK National Air Traffic Services (NATS) installed a BEST ATC tower simulator from Micro Nav. A 360° 3D panoramic display gives a realistic view from both the existing and new towers. The cylindrical screen is 10m in diameter and combines ten powerful projectors, with edge matching and blending to give a continuous field of view. The tower is equipped with Terma’s information support system, ATC*ISS tower. One of the best features of ATC*ISS is the high ratio of COTS (commercial off the shelf) components, because this means a high up-time, a low failure rate, modest maintenance costs and overall systems reliability and safety. Heathrow Airport has two runways. Runway 09L/27R is 3,901m long while runway 09R/27L is 3,660m long. The two asphalt-surfaced runways are aligned in east-west directions. New infrared camera systems have been installed on two runways to enhance the runway safety. Heathrow Airport has regular train services between London’s Paddington station and Heathrow Terminal 5 station or Heathrow Central station. London Underground’s Piccadilly line also serves the airport. Another train, Heathrow Connect, serves Central London, West London and the airport. There are bus services available from the airport to various parts of the UK. A door-to-door London hotel bus service is also available from all terminals. Heathrow International Airport provides four categories of parking. Short stay parking is available for up to five hours. Heathrow business parking provides facilities for three to four days. With valet parking, travellers can have a chauffeur park their cars in a secure place and return to them when they return. Long-stay parking is also available at all the terminals of the airport. Terminal 1 underwent a major refurbishment in 2005 with the opening of the new eastern extension. It now covers an area of 49,654 square metres, with added space in the departure lounge. Terminal 1 has arrivals from the UK and Ireland on the first floor and other countries on the ground floor. The first floor also handles departures. The majority of domestic flights arrive and depart from Terminal 1. The terminal is scheduled to be demolished in 2013 to make way for the second phase of Terminal 2. Terminal 2 was the oldest terminal at Heathrow Airport and stands on an area of 74,601 square metres. It handles 8.5 million passengers annually, with 30 airlines operating through this terminal. Terminal 2 houses check-in and arrivals on the first floor and departures on the second floor. The terminal was shut down in November 2009 for demolition. A new and bigger Terminal 2 is being built in its place. The first phase of the new terminal is scheduled to be completed by 2013, while the second phase will be completed by 2019. In September 2011, Kone was awarded a contract to supply 18 escalators, 12 auto walks and 40 elevators to the Terminal 2 satellite building which is expected to be open for passengers in 2014. Terminal 3 has arrivals and check-in on the ground floor and departures on the second floor. Nearly 15 million long-haul flight passengers use Terminal 3 annually through 35 airlines. In 2006, the terminal received a new £105m Pier 6 which helped accommodate the Airbus A380. A new four lane drop-off area and a large pedestrianised plaza were added to the terminal in 2007. There are plans for a £1bn terminal upgrade to take place in the next ten years. Terminal 4 has received a £200m ($321.96) upgrade which includes redevelopment of the forecourt, extended check-in area, renovated piers and departure lounges, two new stands and a baggage system. It is presently the base of Sky Team alliance and can accommodate 45 airlines. Terminal 4 handles arrivals, check-ins and departures on the first floor. Heathrow Cargo Tunnel connects the terminal with Terminal 1, 2 and 3. As of September 2011, BAA is trialing new security body scanners at terminal 4. The new scanners will show cartoon-like pictures of the passengers rather than graphic body images. Once the trials are successful, BAA would introduce the system in all its airports. 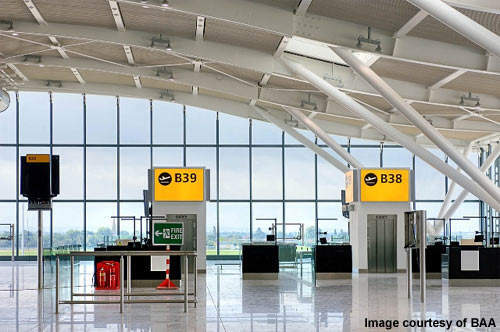 Construction of Heathrow Airport Terminal 5 (T5) in London was approved by the Secretary of State on 20 November 2001, after the longest public inquiry in British history (46 months). The planning process itself cost nearly £63m over a period of 14 years. This cost was borne mostly by the British Airports Authority (BAA) and British Airways, the two main proponents of the project. In 2007, it was announced by the Transport Secretary Ruth Kelly that there would be a sixth terminal at Heathrow, as well as a 2,200m third runway by 2020. But the proposal was cancelled by the new coalition government in May 2010. Construction of the new terminal started in September 2002. Phase one of the project was completed and opened in March 2008, with the second phase opening in June 2011. The project required an estimated investment (mostly from BAA) of more than £4.2bn. Phase two of the project involved the construction of a £350m ($563.43) second satellite terminal building adjacent to the original T5 and also the associated aircraft stands and service infrastructure to accept A380 size superjumbos. Heathrow is one of the busiest airports in Europe and passenger numbers are expected to grow by 27 million a year as a result of phase one, then by a further three million a year after phase two. The airport currently employs 70,000 personnel and expects to increase this by 16,500 as a result of the expansion. T5 is spread over the area of 300,000m² and its retail floor space covers around 18,580 square metres. It includes 150 retail units including around 25 restaurants and approximately 3,250m² of duty free shopping. The terminal has the capacity to accommodate 30 million passengers in a year. A French spa, Be Relax, opened at the terminal in 2009. T5 terminal also has a multistorey car park with more than 3,800 spaces. Terminal 5 was a large infrastructure project, involving more than 60 contractors, 16 major projects and 147 sub-projects on a 260ha site. With such a project, BAA realised that if the projects were to be built on time and within budget that a unique approach would be required. The T5 Agreement was the result and is a legally binding contract between BAA and its key suppliers. Through the agreement BAA accepted that it carried all of the risk for the construction project. This allowed the contractors to concentrate on the project and solving problems rather than avoiding possible litigation for problems arising and time delays. Two of the major projects which were ahead of schedule included the new terminal building itself and the new aircraft control tower. In April 2004 the first section of the ‘single wave’ roof (2,500t) of the T5 building was lifted into position and, by March 2005, the sixth and final section of the roof was in position. The final roof weighed a total of 18,500t and contained 22 steel box section rafters supported by 11 pairs of supporting abutments. The main terminal building (housing concourse A) is 396m long, 176m wide and 39m high and contains 80,000t of structural steel, while a satellite building (housing concourse B) adjoining this is 442m long, 42m wide and 19.5m high. The terminal contains 175 lifts, 131 escalators and 18km of conveyor belts for baggage handling. A strict ban was placed on any construction activity more than 43m high without prior arrangement, in case it interfered with Heathrow’s radar. Phase one of the project provided 47 aircraft stands and phase two provided a further 13 to make a total of 60. In October 2004, the 900t 32m-high top ‘cone’ section of the control tower was transported 2km to the installation site, following its construction within the Heathrow site. In April 2005 the new air traffic control tower was topped out and in March 2005 the control tower was erected to its full height of 87m. The cone, which contains the control room, is supported on top of an 85m-high, 4.6m-diameter triangular steel mast anchored to the ground, with three pairs of cable stays. The steel mast contains two lifts (one internal and one external) to provide access to the control room. 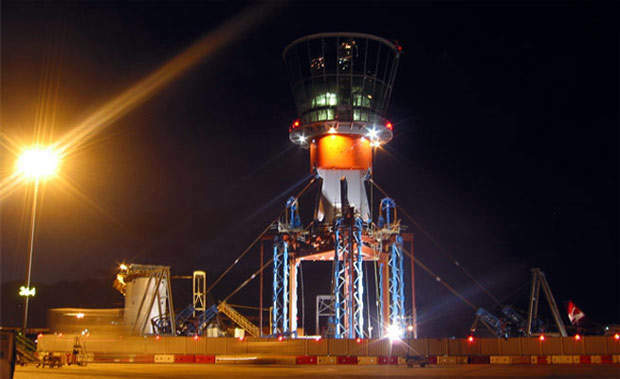 The control tower was built in 12m-high sections (the cone being raised by special jacks 12m at a time) and became operational during the third quarter of 2006. 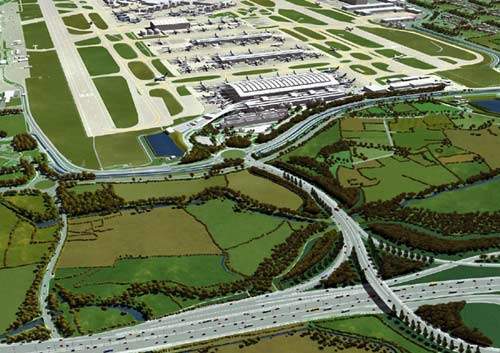 Beyond the construction of the terminal itself, investment has been required in order to improve the transport infrastructure between the centre of London and Heathrow Airport. Some of the major projects were the construction of tunnels for the extension of both the Heathrow Express (HexEx) and the Piccadilly Line (PiccEx). In September 2004, the HexEx tunnel was connected with T5 for the first time after four and a half months of tunnelling with a tunnel boring machine (TBM). The tunnel connection was made with a spur tunnel (headshunt) connected to the existing Heathrow Express. The tunnel was lined with 1,419 pre-cast concrete rings containing polypropylene fibre for fire resistance. There are two 1.7km tunnels for the HexEx and two 1.9km tunnels for the PiccEx. Terminal 5 has its own modern rail station located in the basement of concourse A. The station has six rail platforms: two for the London Underground Piccadilly Line extension, two for the Heathrow Express extension and a third pair built for potential future rail expansion links to the west. The T5 station is staffed by BAA staff, unlike the underground stations at Heathrow Terminal 4 and Terminals 1 to 3, and was completed in March 2008. There are currently no plans to connect Terminals 4 and 5 by a direct rail service. The T5 expansion also required additional and improved road infrastructure, including internal airside roads (completed in March 2005) and also connecting roads from the current road transport network. A spur road from the M25, constructed by Balfour Beatty, opened in April 2008 and the road around the western perimeter of the Heathrow site was realigned to provide improved access. Four tunnel boring machines and 105,500 concrete tunnel lining segments were used to create a network of nine separate tunnels, including the UK’s seventh-longest road tunnel and four independent rail tunnels. 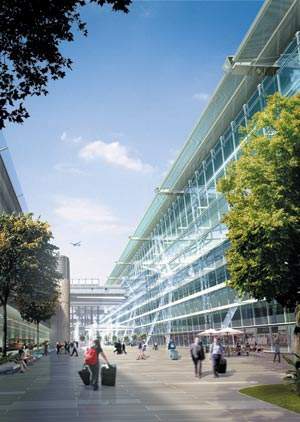 In addition to a growth in the transport capacity servicing Heathrow Airport, BAA also developed a 4,000-space multistorey car park for passenger use. An airside road tunnel (ART), which became operational in March 2005, provides road vehicle access from the central terminal area to aircraft stands at the western end of the airfield and T5 campus. It is an airside road, so is not accessible to the general public. The 6.2km ART consists of two parallel single carriageways with a hard shoulder in two separate tunnel bores. Each tunnel has an internal diameter of 8.2m, which is the equivalent width of two fire engines, and is connected via a series of cross passages designed to ensure the safe evacuation of vehicles or people in the event of a vehicle accident in either tunnel. The new T5 also incorporates a track transit system. This is an automated transportation system which transfers passengers between the main terminal and its satellite buildings. Transportation is provided by an automated people mover (APM). These are driverless trains which run on a dedicated subsurface guide way. In July 2009, the personal rapid transit (PRT) system was put into operational testing at the airport. The PRT system consists of a series of driverless vehicles capable of transporting passengers and their luggage. The PRT system has its own dedicated guide way from the business car park to Terminal 5. The £25m system is the first of its kind in the world. The storm water outfall tunnel (SWOT) forms the drainage and pollution control system for surface water run-off from the T5 campus, to a reservoir two kilometres to the south of the airport. At the southern end of the tunnel the run-off water passes through facilities that ‘clean’ it before it is discharged. The SWOT is also a fundamental component in enabling BAA to recycle the run off water and re-use it in T5’s non-potable water system. The tunnel and infrastructure has been designed so that in T5’s operational phase, clean water is pumped back up the tunnel and used in systems such as toilet flushes and heating systems. The SWOT is comprised of a single bore tunnel, 4.1km in length. Water course modification at the Heathrow site has also involved the diversion of two man-made ‘rivers’ (built during the reign of both Henry VIII and Charles I to supply water to various Palaces) (twin rivers diversion scheme) into new channels. 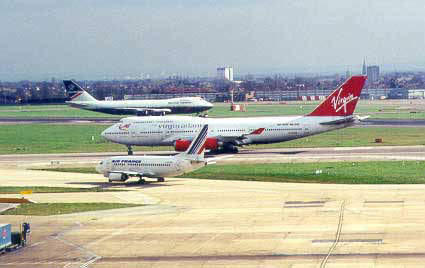 It was expected that the number of people using cars, taxis, buses and coaches in and out of Heathrow would more than double once T5 became operational. This does not take into account extra lorries and other heavy goods vehicles travelling in and out to service the airport on roads that are already three times busier than the national average. In 1991, approximately 13.8 million people travelled to Heathrow by car and 5.8 million by taxi. By the year 2016, when BAA expects T5 to be fully operational, the figures are estimated to increase to 28.1 million by car and 11.9 million by taxi. Another obvious problem associated with the increase in traffic in the area is a worsening of noise and air pollution. 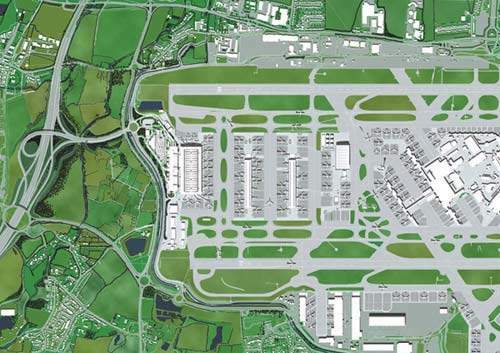 Advocates of T5 countered that the increase in the capacity of Heathrow will make best use of airport’s existing infrastructure and land (nearly 3,000 acres). They claimed that failure to develop the site would lose Britain more than £600m a year in export earnings. Once lost, that trade would be unlikely to return, and it is thought that the UK economy will have felt the impact as foreign investment drifted to Europe (particularly as European airports such as Charles De Gaulle in Paris, Hamburg and Schipol in Amsterdam are trying to attract business from Heathrow). Additionally, the noise climate around Heathrow Airport has been improving for many years, even though the number of aircraft movements has increased considerably. This improvement is continuing, but is inevitably slowing down as older, noisier aircraft have now been phased out. Advocates claimed that even with Terminal 5, the noise climate would be similar to today because it would not require any increase in night flights or in the night noise quota at Heathrow. The reason why these extra passengers can be accommodated with so few additional flights is that the number of passengers per flight is increasing all the time. The development of aircraft such as the Airbus A380 superjumbo, a 555-seater, double-decker aircraft, has reinforced this trend. T5 relies much more on passengers using online check-in or self-service kiosks when they reach the airport. There are 96 self-service kiosks, 140 customer service desks and 96 fast bag drops. Passenger flows have been optimised so that queuing at the airport is kept to a minimum. British Airways have plans to move towards 80% of its passengers using online or self-service check-in. Facial recognition systems are installed to reduce the lengthy processing time at the terminal. The baggage handling system at T5 is the largest in Europe for a single terminal. 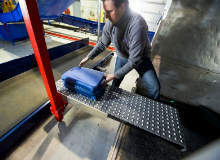 There are two systems, including a main baggage sorter and a fast track system. 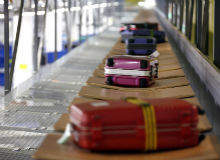 The system was designed by an integrated team from BAA, BA and Vanderlande Industries of the Netherlands, and handles both intra-terminal and inter-terminal luggage and roughly process 70,000 bags a day. Bags undergo several processes on the way through the system, including automatic identification, explosives screening, fast tracking for urgent bags, sorting and automatic sorting and passenger reconciliation. New airport terminals are usually plagued by faults and problems within the first couple of days of opening and T5 was no exception. Despite running a six-month trial, requiring the use of 16,000 volunteers to put every aspect of the terminal to the test from parking and toilets to check-in and seating, the terminal experienced a host of major problems on day one. On the first day of operations staff experienced difficulty getting through security into the building, once there they had navigational problems, and delays were compounded by a lack of available car parks. For passengers, staff unfamiliarity with the check-in system led to flight delays, which in turn overloaded the baggage handling system. The end result was the cancellation of more than 300 flights and the mishandling of thousands of items of luggage. The debacle cost BA at least £16m, and resulted in the resignation of two senior managers. T5 was branded a ‘disaster’ by government ministers, with the Commons Transport Select Committee launching and enquiry. The subsequent transfer of long haul flights from T4 was delayed, finally taking place in June 2009. In January 2009, a third runway at Heathrow received government approval after months of debate and controversy. The government wanted BAA to open the runway to serve the airport’s expansion as soon as possible and definitely before 2020. But after the General Elections in 2010, the Conservative-Liberal Democratic coalition cancelled the runway expansion. More than 50 businesses support the plan but it always faced fierce opposition from environmentalists. HUB Performance offers capacity constraints solutions for airline travel. Our services range from passenger terminal capacity planning and performance measurement, to baggage and cargo handling simulation and optimisation, to passenger flow management. OMK are global market leaders in the design, manufacture and installation of public area seating systems.